When the US Forest Service initiated far-reaching Travel Management planning in 2005, mandating that all National Forests analyze off-road vehicle use on their lands, and specify roads and trails where off-road vehicles would be allowed, wilderness and quiet-use advocates were thrilled. Before that, many forests allowed free-ranging use of ATVs, dirt bikes, and other vehicles on any trail not specifically designated as off-limits with posted signs. Thanks to the all-too-common practice of removing such signs, along with the more-than-occasional off-trail use that created “new” trails over time, the new rules, which turned the tables by allowing vehicles only in areas clearly designated for their use was a big step forward. Those traveling by foot could look forward to having a bit more separation between themselves and lovers of motorized recreation; often, ridgelines separated basins where visitors could expect to find substantial natural quiet. Except in winter. 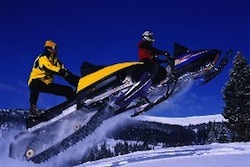 The groundbreaking Travel Management Rule specifically exempted snowmobiles from being subject to the limits contained in each forest’s local Travel Management Plan. The reasoning was that many of the damaging aspects of unfettered ORV use were less relevant in winter; in particular, damage to vegetation and streambeds, and all the related risks of increased erosion. These impacts are indeed significantly less in winter, though some soil compaction can occur beneath snowmobile trails over meadows. But one key impact from motorized use can actually be worse in winter: the noise footprint of the vehicles. Thanks to better sound transmission in cool air and across frozen, leafless landscapes, the sounds of snowmobiles often travel much further than the sounds of ATVs and dirt bikes in summer. This can clearly impact other forms of recreation, as well as disturbing animals who are sensitive to noise intrusions. In Idaho, lovers of “quiet recreation” worked hard to get snowmobiles included in national and regional travel planning, and when they failed, the national Winter Wildlands Alliance took the question to the courts. Mark Menlove, executive director with the Winter Wildlands Alliance, said the decision was a monumental victory for backcountry skiers and other winter recreationists seeking a peaceful experience in the woods. The group’s goal is to not shut down snowmobiles in national forests, but force the agency to designate specific boundaries that carve out distinct areas for those who want to explore on powered sleds and those preferring skis, snowshoes and hiking boots. While this ruling applies only to National Forests in Idaho, it may lead to similar reviews and expansion of travel management planning nationwide.